Be sure your child is ready for anything, having the confidence to make and take the toughest of tackles with the Canterbury Vapodri Raze Vest Kids Body Armour in Black. 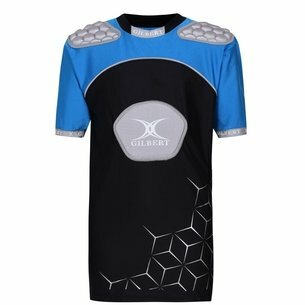 This quality children's body armour from rugby specialists Canterbury is IRB approved and sure to help protect your child from a majority of common injuries in the torso region with EVA foam padding on the shoulders, chest and kidneys to absorb the impact of heavy challenges. 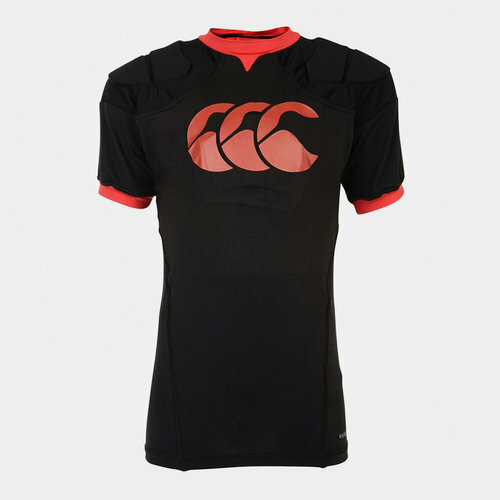 Made from polyester and elastane material, this tight fitted protective top includes Canterbury Vapodri technology to help keep the wearer feeling cooler, drier and more refreshed during the middle of a match thanks to it's ability to absorb moisture and quickly dry. Mesh material helps enhance this cooling effect by improving air circulation whilst underarm gussets allows for more freedom of movement. Arm your child so they can commit themselves to the game with the Canterbury Vapodri Raze Vest Kids Body Armour, lowering the risk of injury so you can worry more about them winning than crunching tackles.